Looking to turn it up a notch with your child's bath? Have you heard of Gelli Baff? I saw it in stores last month and thought it looked neat. Then, a couple weeks later I was sent samples of this bath time product from Zimpli Kids, which turns your bath water in goo. Yes, you read that right, goo. Think a jello consistency that is crushed up so it is chunky or curdled. Now you would think with something like this that it wouldn't be safe for your bathtub, or to wash down the drain after you are done playing, but it is 100% safe. And, thanks to a Gelli Baff dissolver that comes with the kit, you simply pour this powder in when you are done playing with the Gelli Baff and it dissolves the goo back into colored water, so that you can drain the tub as you usually would at the end of bath time. 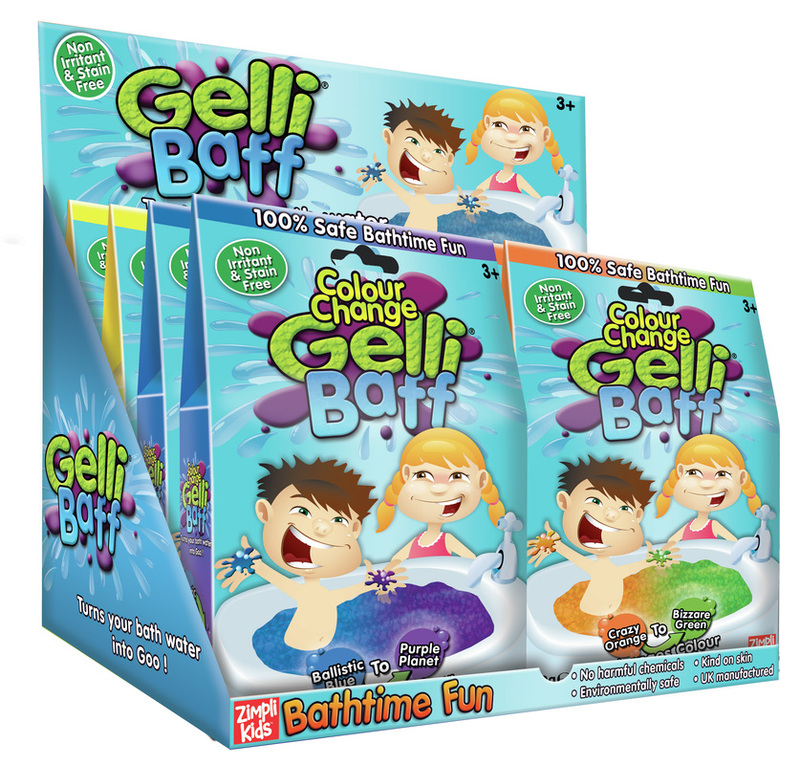 Gelli Baff comes in a variety of colors including blue, green, pink and purple. And, if even though the water changes into a dark hue of these colors, it doesn't stain or ruin your tub, which I have to say I was nervous about when I first saw the Gelli Baff turning the bath water colors. Creating a Gelli Baff is so easy. You simply fill your tub up, add the Gelli Baff powder and swirl it around. It will start to thicken and curdle up into a fun goo like consistency. And, as it sits, it thickens even more. By the end of bath time the other night, it felt like a thick wet sand to the girls. They were having so much fun that they didn't want to get out of the tub. Thankfully I had another box of Gelli Baff which I was able to use show them and them we would do another night. The girls had so much fun swimming in the goo, and playing with their toys in it. But, their favorite thing to do was simply scoop of the Gelli Baff and play with it in hands and let it run through their fingers. It was just the coolest thing they had seen or felt. And, they said the Gelli Baff made bath time so much more fun. 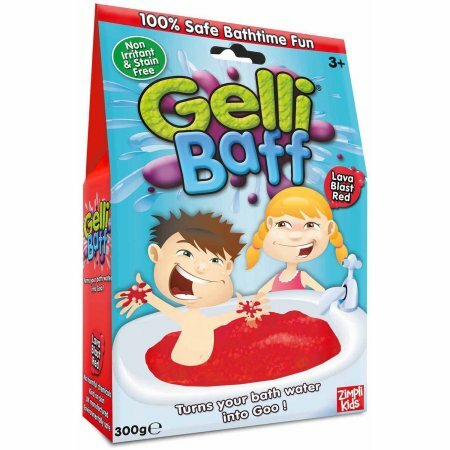 :-) I have to admit as I watched them playing with the Gelli Baff I wished there was something like this out there for adults, as it looking really fun to just like a tub with this goo and relax. 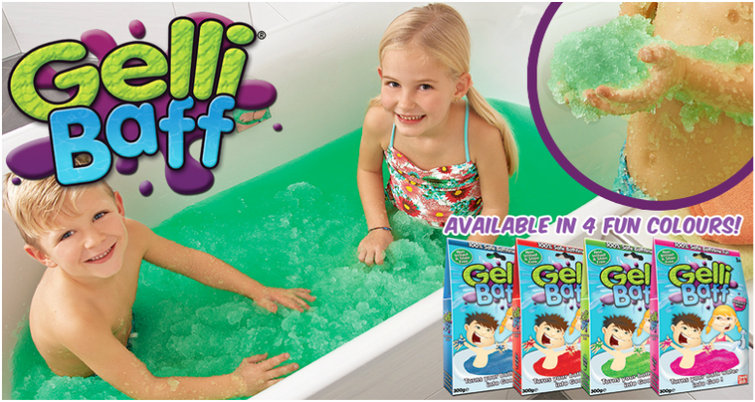 "Gelli Baff is a totally unique, fun, bathtime product that lets you turn water into goo and back again! By adding Gelli Baff powder to water, you create a thick colourful goo. By simply adding a second ‘dissolver’ powder, the goo turns back to coloured water to be drained away safely and easily." If you are looking for a fun bath time experience to share with your child, or just want to add a cool gift to their stocking, why not consider picking up a box of Gelli Baff today. I originally saw Gelli Baff from Zimpli Kids at my local Walmart, but have also found it is sold online through Amazon, Toys 'R Us and Walmart online, too. Kits range in price from $8-$15 depending on how many packs are included in your box. The sample boxes I was sent were enough to do 1 full-size tub. But, I have seen other kits that have 6-packs with 3 color in the box, so that you can experience a Gelli Baff multiple times, or if you have a big tub, can add more packets to get a better goo consistency. I have to say that Gelli Baff was a hit with the girls, and they can't wait to have another Gelli Baff bath time experience soon. And, I have to agree it was need to see the water go from clear to colored to chunky and then back to a colored liquid state. It was like magic right before your eyes. To learn more about Gelli Baff and the different versions available -- glitter, color changing, smelly, etc., visit Zimpli Kids.